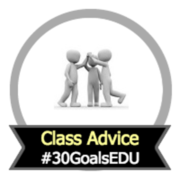 Ask your learners to come up with advice for being successful in your class, the grade level, or subject. This advice will be used to help students next year. Some options for presenting these to next year's students include adding the advice in a Padlet, Touchcast video, or Voicethread.